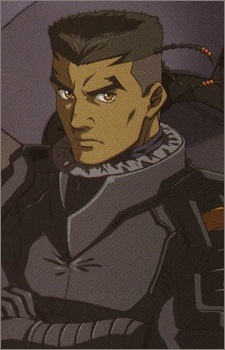 SRT team's current team leader, callsign Urzu-1, first appearance in the novel 'End of Day By Days' and the 2nd anime series Full Metal Panic: The Second Raid, replacing Captain Gail McAllen after his death near the end of the novel 'Rocking into The Blue' (and subsequently, the 1st anime series). Pilot of the M9D Falke and was a part of MITHRIL's Mediterranean Sea Fleet. His first introduction into the team was kind of unorthodox, ticking off Kurz Weber and Sousuke Sagara by saying McAllen was a coward after sitting on the chair he used to sit on while in reality, McAllen was one of his most trusted teammates and a good friend. Proved himself to be an expert martial artist by incapicitating Kurz with just one move and defeating Sousuke and the Arbalest during the 'test' which he conducted. He also proved to be a capable leader when he made Sousuke understand why he lost and told him that it wasn't his skill as they were actually evenly matched in that aspect but rather his hatred for the Arbalest and tells him that an Arm Slave is like a part of their own bodies. Since then Kurz and him don't really see eye-to-eye, though they have developed a grudging respect for each other's abilities. It is also known that he & Melissa Mao have known each other since way back. His nickname from Mao was 'Bel'. He was also one of the few remaining survivors of the attack on Melida island, along with Melissa Mao, Kurz Weber, Richard Mardukas, Teletha Testarossa and most of the crew of the Tuatha de Danaan at the end of the novel 'Continuing on My Own'.